AMD announces the arrival of a new graphics card to the market, but it is not a normal card, because it is focused on the people who use these components to undermine cryptocoins like Bitcoin or Ethereum. The new AMD Radeon Vega Frontier is a graphics card with its most powerful graphics processor and designed especially for the professional public, as people who need the maximum power to export video or 3D graphics. It has 16GB of HBM2 memory which gives it a performance of 13 TFLOPs and it is powered by two 8 + 8 pin PCI-E connectors. There are two models, one that is cooled with a fan that will cost $999, and another one cooled with water that will cost $1,499. The important point is that its performance is above its competitor NVIDIA Titan Xp and is more affordable. Although AMD positions it as a graphics card for professionals, the reality is that it is a perfect card for all the people and companies that use these cards to undermine Bitcoins. These people use these cards to calculate the complicated mathematical formulas that use these virtual currencies since it is more powerful than the normal processors. The expansion of the Bitcoin and the special explosion in the last months of the Ethereum currency, have caused something curious: a great rise of prices of powerful graphic cards. Although not in all countries, in many there are problems of supplying popular cards with Bitcoin mining, such as the AMD RX 580 or NVIDIA GTC 1080. In many stores are not available or directly those that exist, have climbed quite recommended price by the manufacturer. 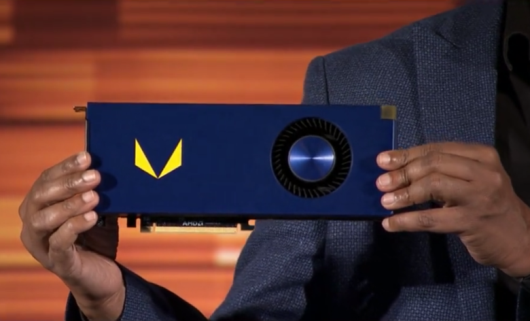 Who will eventually buy the new AMD Radeon Vega Frontier? Surely professionals, but should not be surprised that it is difficult to buy because the entire stock ends up being sent to China, where there are many mining companies of cryptocoins.